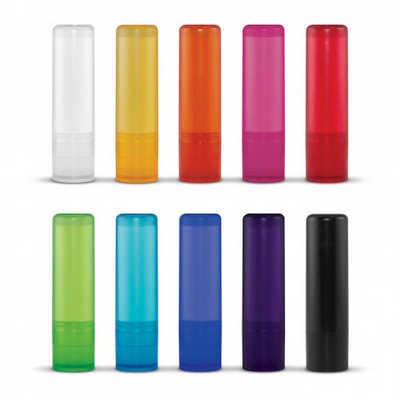 Lip balm in a handy twist action, frosted translucent tube. It has a pleasant fragrance and an SPF10 sunscreen Colours: White, Yellow, Orange, Pink, Red, Bright Green, Light Blue, Dark Blue, Indigo, Black. Dimension: Dia 19mm x H 70mm. Print Description: 42mm x 10mm. Print Type: Pad Print. Packing: Loose packed. Price includes : 1 Colour 1 Position Print Setup is included.